At Saturday & Sunday performances: Joyce Reehling as Ouiser! Joyce Reehling spent over 30 years in New York working in the theatre. On Broadway, she appeared in Fifth of July and Prelude to a Kiss. She was a member of the prestigious Circle Repertory Company where she originated many roles for Lanford Wilson, Milan Stitt, David Mamet and others. Joyce worked with William Hurt, Christopher Reeve, Richard Thomas, Debra Monk, Swoosie Kurtz, Jeff Daniels, Cynthia Nixon to name a few. Joyce did many commercials for TV and Radio; she was the first Dr. Mom and was the voice of IKEA on radio. TV shows such as Law & Order, Ed, Kate and Allie, NYPD Blue, Cosby and numerous daytime dramas were a part of her career. She is a proud member of Actors Equity and SAG-AFTRA. She and her husband now reside in Pinehurst and she writes for The Pilot. Opening night of STEEL MAGNOLIAS was a smash! The audience greeted our cast with a standing ovation! Thanks to everyone who attended. And our second performance Friday got a Standing Ovation too! FAYETTEVILLE OBSERVER and SANFORD HERALD on STEEL MAGNOLIAS! We had features on STEEL MAGNOLIAS starring Dawn Wells today (3/23) in three area newspapers–The Pilot (previously posted), The Fayetteville Observer, and The Sanford Herald! 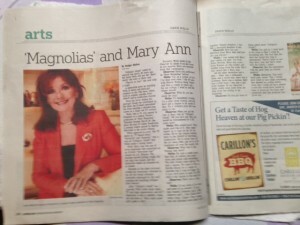 THE PILOT’s sensational Sunday story on STEEL MAGNOLIAS! A great feature by Mary Elle Hunter with quotes from cast members Dawn Wells, Mackenzie Thomas, and Sarah Frances Berk! 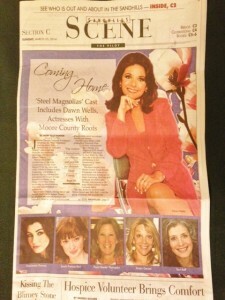 National press: PLAYBILL.COM and BROADWAY WORLD features on STEEL MAGNOLIAS! Playbill.com and BroadwayWorld.com published stories about the beginning of rehearsal for STEEL MAGNOLIAS!